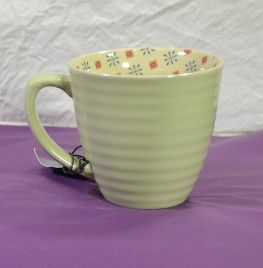 Beautiful Pistachio mug with paisley pattern border round the inside of the rim. 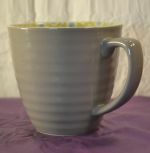 Good size and lovely to hold, this mug is great for Coffee or any other hot drink. Lovely rippled outside and pretty design just inside the rim. 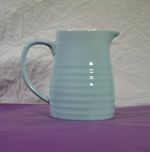 Matching mugs available in Smoke, Purple & Aqua colour - see our mug section for more details. Also Matching tray available in 2 sizes - see out Tray section.